MYTH 1: LASIK can’t fix astigmatism: If you have an astigmatism, you probably already know what it is and have used the football analogy to describe it to people don’t know what you’re talking about but, can LASIK turn your football-shaped cornea into a basketball? Actually, it can, depending on how much correction is needed. LASIK works by using a highly focused laser to reshape the cornea, and people with mild to moderate astigmatism can be candidates, which can be determined by Dr. Concool. MYTH 2: It hurts! Many people avoid LASIK out of fear, but thanks to modern medicine, you’ll most likely feel a lot less pain than yore expecting. Before the procedure, we place numbing eye drops in your eyes. Discomfort levels always vary from person to person, but you’ll likely feel a slight amount of pressure that usually lasts no longer than a minute. Still a little nervous? We highly recommend coming in for a free consult and speaking with Dr. Concool. He can also prescribe medication prior, if needed, to calm your nerves. And bring on the questions! The more you know, the less there is to be afraid of! MYTH 3: It’s dangerous. Nope, it’s not. While there are potential side effects with any medical procedure, complications can usually be managed with follow-up care. The frequency and severity of complications vary, depending on how much nearsightedness, farsightedness and/or astigmatism you have prior to the procedure. MYTH 4: Everyone is a candidate for LASIK. Not true. LASIK can provide excellent results when performed on the right patient, BUT it’s not for everyone. 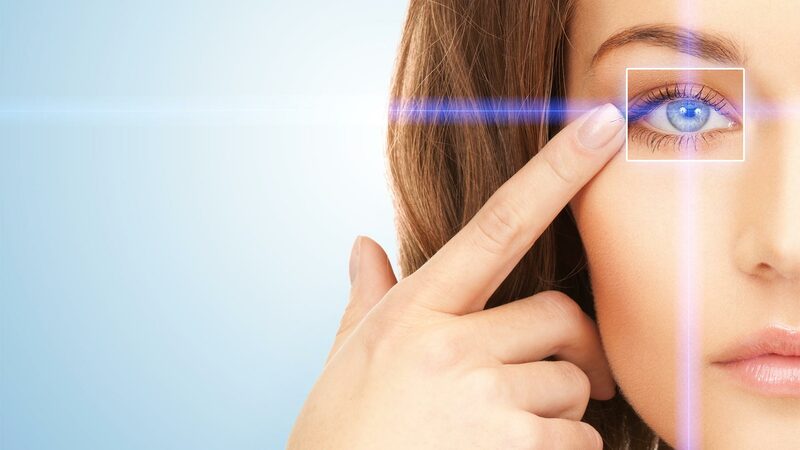 If you have collagen vascular, an autoimmune disease, or an immunodeficiency disease, you should avoid LASIK, as they affect the body’s ability to heal. Also, if you are pregnant, nursing, experiencing corneal thinning, or taking medications with eye-related side effects, you should not get LASIK. MYTH 5: There is one kind of LASIK. Nope, there are many different types of LASIK procedures….one being blade-free LASIK? Wait, LASIK involves a BLADE? Yikes! It can, but it doesn’t have to. When preparing your eye for the procedure, a doctor can use either a microkeratome blade or a femtosecond laser (blade-free), like we use here at Panhandle Laser Vision Institute. MYTH 6: LASIK involves one laser. LASIK actually involves 2 lasers — the femtosecond laser (as mentioned before), which is used to prep your eye for the vision correction part, followed by an excimer laser, which is used to correct the corneal tissue to FIX your vision. MYTH 7: I have to pay for LASIK up front in full?! Definitely not true. Yes, LASIK can be costly, but while we are talking about your eyesight here, we realize that’s not exactly pocket change. Fortunately, many LASIK surgeons recognize this and offer payment plans either directly through our office or through a company called CareCredit. MYTH 8: I have to keep my eyes open for a long time. It’s a proven fact that the average person blinks between 15 and 20 times per minute. Knowing this, your eyes are likely already starting to water thinking about how long you’ll need to keep them open for LASIK. Remember those numbing eye drops we mentioned earlier? Those help reduce your impulse to blink and your LASIK takes less than one minute on each eye! MYTH 9: I have to put my life on-hold to recover. This one is sort of a myth because it depends what you do with your life. For example, if you’re a swimmer or do high-impact sports, you’ll want to talk to Dr. Concool about when it’s okay to resume these activities. If this doesn’t sound like your typical day, then it’s safe to assume that you’ll mostly likely be able to go back to your daily routine the next day. As with any surgical procedure, side effects and recovery time can vary. MYTH 10: If I move my eye, I can mess up the procedure. Go ahead and cross this one off of your list of concerns. The laser used in the procedure has built-in technology that tracks and accounts for your eye movements. This keeps the laser on track to correct exactly the right spot. Always remember that there can be side effects associated with LASIK and while they are rare, they can include eye dryness, which may be severe, loss of visual acuity or the need for glasses or contacts after surgery, and visual disturbances like halos (hazy rings around lights), glare, starbursts, double images and other visual irregularities that may be debilitating. All of our LASIK consultations at Panhandle Laser Vision Institute are free and we highly encourage you to come talk over your concerns with Dr. Concool. Call us at 850-438-1277 or email us at info@panhandlevision.com for more information.